Here's a little starter Summon for ya'll. I'll set the character, but I'd like to see how someone handles this before I make my own post. Wind Blast- Gust of wind that does damage dependent on distance to target. Lightning- several simultaneous blots of lightning flash down on the target. Mega Flare- Bahamut's most powerful move. He flies high, into the planet's orbit, gathers energy through his wings to power his breath, and from his mouth, releases a powerful, brilliant blue energy ball, dealing massive damage to target. Ok, this is one of the guys I posted a video on in the "Summons" thread, so if you look at that, you have an idea of how this creature fights. Warning however, it contains spoilers. No takers? Alright. I'll go first. Kane dogded and parryed away all the bullets being fired in his direction using his Fusion Sword. He hacked away at the Wutai troops until all of them were down, then stayed his sword across his back. He looked at the metal door in front of him. On visual analysis, it looked to be made of ceramocarbide steel, one of the toughest metals in the world. It would be enough to challenge a Soldier 3rd or 2nd Class, but not a 1st Class Hero! He channeled materia though his fusion sword, taking it in his hands again and rushed the door, slashing it in half and bursting right through. He stepped into the room behind it to find only a small chest in front of him. He opened it. The room changed as the interior of the chest glowed. The chest was set with a trap. The last thing Kane saw before everything went white was a large materia circle that dissappeared as soon as it had come. When he looked around, everything was different. He was standing on plain ground, which appeared to be a platform suspended by strong winds from several tornados. Several isolated rocks were surrounding the platform as well. Then, from behind, a great Bahamut Dragon flew in and landed. He knew this wouldn't be an easy fight. Kane readied his sword, splitting it into two swords so he'd be able to attack swiftly. He attacked as fast as he could, leaping up and striking the creature in the face repeatedly with each leap, but Bahamut waas so strong. He was hard to fight, harder than Kane had predicted. 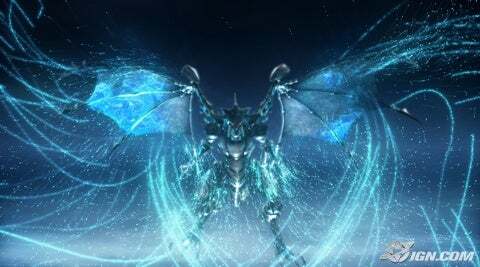 Bahamut swiped at him with one of his wings, blowing him back, and it would have done alot of damage to Kane, but he had his sword up in a block, which lessoned the wind and kept him on his feet. The blast of wind was over in a second, and when he lowered his sword, Kane found Bahamut to be missing. Then he looked up, but it was too late. Bahamut landed right behind him, scrathing his back with one of its toe claws, sending him forward as he did so by a gust of wind from his landing. Kane picked himself back up, ready to continue. He was already low on health. He used his Curaga materia to restore himself and attacked Bahamut with Blizaga. This mad a large peice of glacier apear above Bahamut's head, which fell and crashed on him, dealing quite a bit of damage, but nowhere near enough to make much of a dent in his health meter. Kane then attacked with Firaga, which sent three fireballs flying towards Bahamut at once, and dealed a little less damage than Blizaga did. The Kaiju Master was leaning against the wall of the Utah state capitol, eating a bowl of rice, when suddenly a bright flash of blue light occured. He looked up to see a barcode monster and above him Bahamut. "Let us see you fight this and survive." The creature disappeared and Bahamut attacked with his high jump. Why did I give Ragaliber a day off? He aimed up towards Bahamut as he came down at him and fired a volt bomb. The bomb hit but not much effect. Bahamut landed next to him sending him flying into a nearby building. He flew through it. He got up. "Okay, Bahamut, Let us see this. CELESTIAL FLASH FROST!!!" Bahamut was now frozen over. "That was easier then I thought." Suddenly the beast began to vibrate violently. Then the ice shattered. Bahamut was now staring angrily at him. Smoke coming from his nostrils. "Hi."